Q: Where can I find a local dealer? A: For Singapore and Malaysia, you can locate a dealer nearest to you by clicking on 'Where to Buy' . For other countries, please contact your local Pioneer office for dealer information. Q: Who should I contact to have my Pioneer player repaired in Singapore? A: To get your Pioneer player repaired please contact. Q: Can I purchase products directly from Pioneer? A: Unfortunately Pioneer do not sell directly to the public only through our dealer network. Please refer to our Where To Buy section on our dealer locations for more information. Q: I have purchased a Pioneer product, can I register the warranty online? Q: Does Pioneer sell extended warranties on their products? A: Pioneer does not offer extended warranty coverage. Q: Can I apply for international warranty for my newly purchased Pioneer Hi-Fi set? A: Yes, simply fill in your overseas address in the warranty card and send it together with a photocopy of the purchase receipt to our service centre. The international warranty card will be mailed to your overseas address. For further enquiry, kindly contact our Call Centre at 6472 7555. Q: Where can I get spare parts or operating manuals? A: Spare parts and instruction manuals can be obtained from Pioneer Service Centre. Please contact our Spare Parts coordinator at 03-2697 2920 to check on stock availability. Q: Can any JPEG pictures be projected onto the screen? A: Yes, it is not affected by the resolution of the JPEG pictures. The monitor behaves the same as any other monitor or television you have. Q: Why is it the two sides mask of the 4:3 ratio aspect do not have equal balance measurement between them? A: There is no equal measurement between the two sides as the screen will move about every few minutes to reduce the burning effect on the sides of the screen. Q: Why does the plasma TV in the PC mode turn off by itself after a few minutes? A: Check that the power management setting is set to off. In the case where there is no signal input, the plasma will automatically turn off in the power management mode. Q: Can I watch 2 different TV program in the split screen mode? A: No, the media receiver only employs one single tuner unit. Q: Why are there some data lost when receiving Teletext? A: Please check the antenna for maximum signal strength. Q: Why is the picture not clear? A: Please go to the Home Menu and select the DNR mode to improve the picture quality. Q: Can I connect a video camera to the Plasma TV? A: Yes, simply connect it to the front input of the media receiver. Q: There is no power and I cannot turn on the Plasma TV. A: Check that the Plasma Display and Media Receiver power cables are connected to the power outlet and press the Plasma Display and Media Receiver's POWER buttons to switch power on. Q: One side of the speaker has no sound. A: Check that the speaker wire is not overly clipped into the speaker outlet terminal. Q: The remote control unit does not work or is difficult to operate. A: Check that none of the key button is jammed or stuck. Remove any obstruction from in front of the remote control sensor. Point the remote control unit facing the PDP display. Replace the battery in the remote control unit with a new one. Q: Why doesn’t the power button on the remote control turn on the set? A: The design of the power button on the remote control is for turning off the TV only. To turn on the TV, please select from the numerical button on the remote control. Q: Can we display a split screen image in 2 colours system? A: No. The scanning rate between the two systems will not match. Q: Can I hang my Plasma monitor upside down? A: No. Consumer TV does not come with a special mode to inverse the image. Q: Is it normal for the media receiver to become hot? A: Yes, it is normal and within specifications. Q: SD11 is displayed and the power turns off. A: Check for choking ventilation outlets and clean them if necessary. Q: I forgot my password for the child lock function. A: Please refer to the operating manual on how to reset the password. Q: The PC image on the Plasma is not clear or have double image. A: In the PC mode, go to Home Menu, select for Phase function. Adjust for the correct PC image phasing. Q: How do I clean my plasma? A: When cleaning the screen or cabinet of the television or monitor, gently wipe it with a dry soft cloth (the supplied cleaning cloth or other similar cloths e.g. cotton and flannel). If you use a dusty or hard cloth or if you rub the screen hard, the surface of the product will be scratched. If you clean the surface of the screen with a wet cloth, water droplets on the surface may enter into the product, resulting in malfunction. Q: Can my DVD player play VCD disc? A: Most, but not all Pioneer DVD players will play VCD disc. Pioneer cannot guarantee that all home made VCD disc will work on our DVD players due to the very complex and variable nature on digital video and VCD disc authoring. A: Check on the colour system of the TV, (ie., auto, NTSC, PAL, SECAM). Recommend set to Auto. A: DVDs and CDs use different recording methods. This is not a malfunction. Q: There is a howling or high-pitched sound from the speakers when using the karaoke function. Q: There is no picture when I play the DVD. A: Check that cord connections are correct and that plugs are firmly connected. Be sure that your TV, receiver, or amplifier are set up to view DVD playback. Q: Is my DVD player compatible with DVD-R or DVD-RW disc? 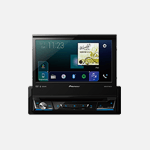 A: All current Pioneer DVD players are compatible with Video mode DVD-R and DVD-RW disc once they have been finalized. Q: What is the difference between DVD-Audio and DVD-Video? A: DVD-Video is primarily a visual medium that offers better picture quality compared with VHS tapes and VCD. Some DVD-Video also offer stereo and compressed multi- channel surround sound utilising Dolby Digital or DTS encoding for better sound quality. DVD-Audio offers sound quality that is superior compared to that in DVD-Video or CDs. Q: Am I allowed to change the audio type? A: It is possible to select stereo audio, or either right or left channel mono depending on the requirements of the source. Press the audio button on the remote control repeatedly to select the desired audio track/mode. Q: How do I maintain my DVD Player? A: Discs spin at high speed inside the player. If you can see that a disc is cracked, chipped, warped, or otherwise damaged, do not risk using it in your player, you could end up damaging your unit. Do not use in a dusty or damp environment or in a room where it will be exposed to excessive cigarette smoke. Q: Can I use lens cleaners for my DVD player? A: Although lens cleaners for DVD players are commercially available, we do not recommend using them since some may damage the lens. Q: Where is a most suitable location to place my DVD recorder in order to maintain it well? A: Use in a well-ventilated room. Place on a solid, flat, level surface, such as a table, shelf or stereo rack. Do not use in a place exposed to high temperatures or humidity, including near radiators and other heat generating appliances. Do not place at a location where the player will be exposed to direct sunlight. Q: Can I play on another DVD player a DVD I recorded using a Pioneer DVD recorder? A: Yes, you can generally play finalized DVD-R discs and finalized Video mode DVD-RW discs recorded on Pioneer DVD recorder on any standard DVD player. For VR mode, only players that are 'DVD-RW Compatible' will play the disc. Q: How do I make a high-quality copy using Pioneer DVD Recorder? A: For higher quality recording, use the Fine mode or SP mode. Q: What is a PhotoViewer? A: The PhotoViewer allows you to view JPEG photos and picture files stored on a CD-ROM/R/RW on your TV. Q: Does Pioneer DVD Recorder allows me to record from my VCR or camcorder? A: Yes. Connect a set of audio and video outputs of your VCR or camcorder to a set of inputs on this recorder. A: YCPRM stands for Content Protection for Recordable Media. It is one of the technique of copy guard protection for recording the "record once only" program. Q: How many times can DVD-RW be rewritten? A: About one thousand times. Q: How to distinguish usage of VR mode & Video mode? A: If you want to record or edit TV program, VR mode recording is recommended, which has a lot of editing functions. If recorded disc is played by DVD player, Video mode recording is recommended because some DVD players do not support VR mode recording. Q: Is my car stereo compatible with your CD changers? A: It will only be compatible if it is a Pioneer model and has a 'P' in the model number i.e KEH-P or DEH-P.
Q: Can I play DVD-Audio discs on a CD player? A: No, DVD-Audio discs cannot be played on a conventional CD player. Q: What is the difference between DVD-Audio and CD? A: DVD-Audio can provide much higher quality stereo than CD with a sampling rate of up to 192kHz for two-channel recordings (compared to 44.1 kHz for CD). DVD-Audio digital sound can be delivered with up to 24 bits of data (compared to 16 bits for the CD standard) and unlike CD, DVD-Audio has the ability to offer Advanced Resolution multi-channel sound. DVD-Audio discs may also offer visual content that can be accessed from on-screen menus. This may include text information such as artist biographies, playlists and lyrics; photo galleries; and even video clips. Q: Is my Pioneer car stereo compatible with the iPhone 5 and Apple’s new iOS6? A: Yes, your Pioneer car stereo is compatible with the iPhone 5 and iOS6. We have completed compatibility testing with our current line of car electronics in-dash audio video receivers. For a comprehensive guide on the extent of iPhone5 and iOS6 functionality with your car stereo model, please click here. A: Check that cord connections are correct and that plugs are firmly connected. Be sure that your TV, receiver, or amplifier is set up to view DVD playback. Q: Can I use lens cleaners for my player? A: Although lens cleaners for such players are commercially available, we do not recommend using them since some may damage the lens. Q: I can hear 2 languages at the same time when playing VCD. A: Toggle between left and right channels using the "Audio" button to select the desired language.